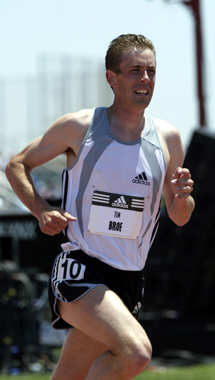 Tim Broe got his start in competitive running like most of us did - his friends said they were going out for the team. That was back in seventh grade. Perhaps Broe feels he owes them a bit of gratitude for their choice of sports. Out of that single decision emerged one of the best U.S. 3000/5000 meter runners. The 2004 Olympian was a very good runner in high school garnering four state championships (2-xc, 2-track), but not someone you would expect to make an Olympic Team, set an American record or a national championship meet record. In fact, he wasn’t sure he was going to seriously compete in college after high school. Then the University of Alabama offered him a full scholarship. At Alabama he was a 12-time All-American. He capped off his college career winning the 2000 NCAA 3000m steeplechase. He never considered competing professionally after college simply because he never thought about it. “I spent all of my time trying to beat Arkansas,” says Broe. However at the 2000 Olympic Trials he had a wake-up call. He finished 4th in the 3000m steeplechase just one place away from making the Olympic team. His decision to continue training and competing was made. A year and a half later he broke the American indoor record in the 3000 meter run. Tim lives and trains in Peoria, IL. Although mostly self-coached, Tim develops his workouts under the guidance of University of Michigan head coach Ron Warhurst. Tim is an avid sportsman. He spends much of his free time hunting and fishing.